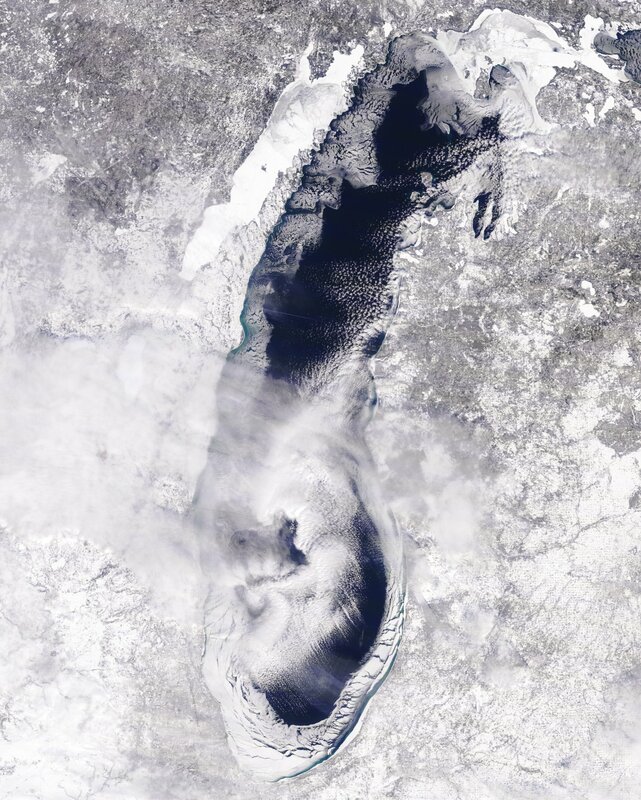 A warm start to January, followed by an abundance of snow and record breaking cold! January 2019 will be a month remembered by an unseasonably warm start, followed by several cold air outbreaks and a torrent of winter storms that finally made it feel like January in the Midwest. The last two days of the month brought a monumental Arctic air outbreak that shattered many record cold temperatures across the state. January ended cooler, and substantially wetter than the long term average. The preliminary average statewide January temperature was 24.7°F, which is -1.7°F below the long term average. 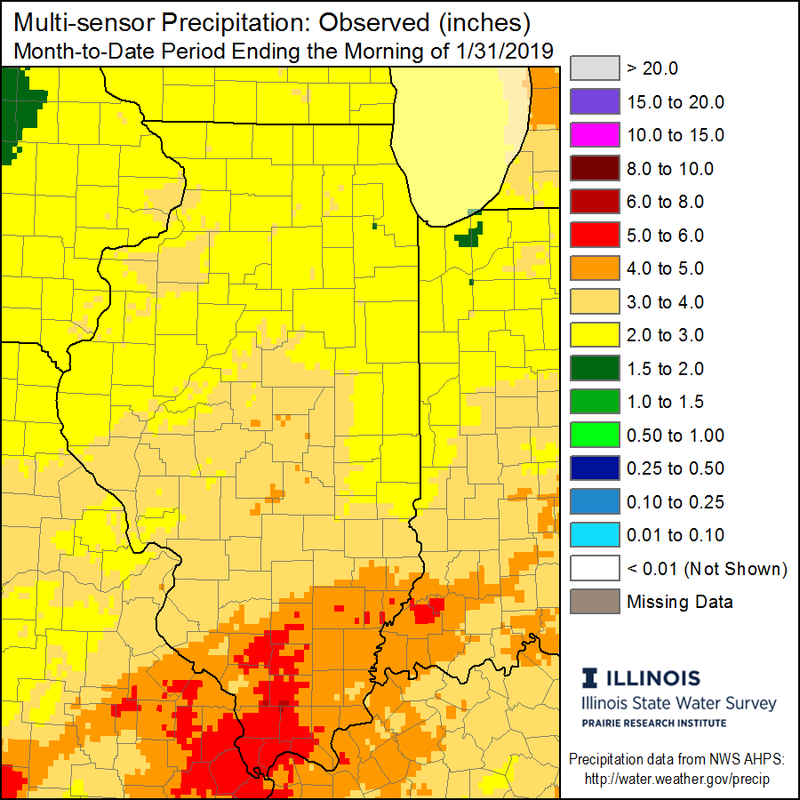 The preliminary average statewide precipitation was 3.51 inches, which is 1.44 inches above the long term average. A National Oceanic and Atmospheric Administration (NOAA) cooperative (COOP) weather observer at Mt. Carroll (Carroll County) reported a temperature of -38°F on the morning of January 31st. This unofficial temperature is currently under review by the State Extremes Committee, and if confirmed with be a new state record. The current record is -36°F recorded in Congerville (Woodford County) on January 5, 1999. 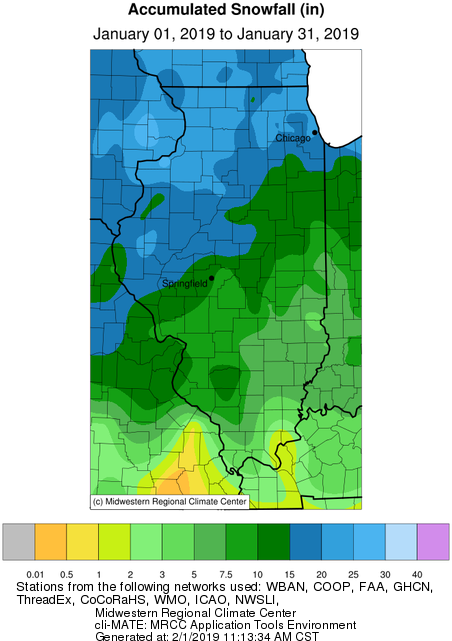 In addition, multiple all time station record lows were set in Illinois on the morning of January 31st. Some notable records include, Moline (Rock Island County) with a reading of -33°F , and Rockford (Winnebago County) with a reading of -31°F, as reported by the National Weather Service. 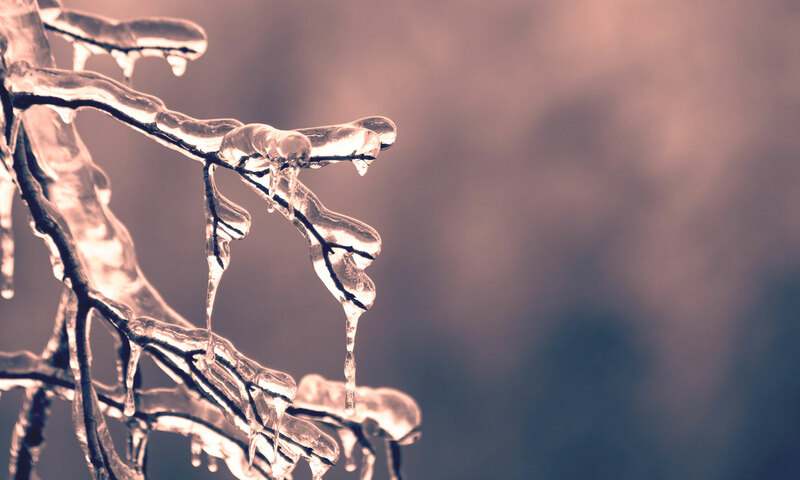 Preliminary results show that January 2019 finished with a statewide average temperature of 24.7°F which is -1.7°F degrees below the long term average. 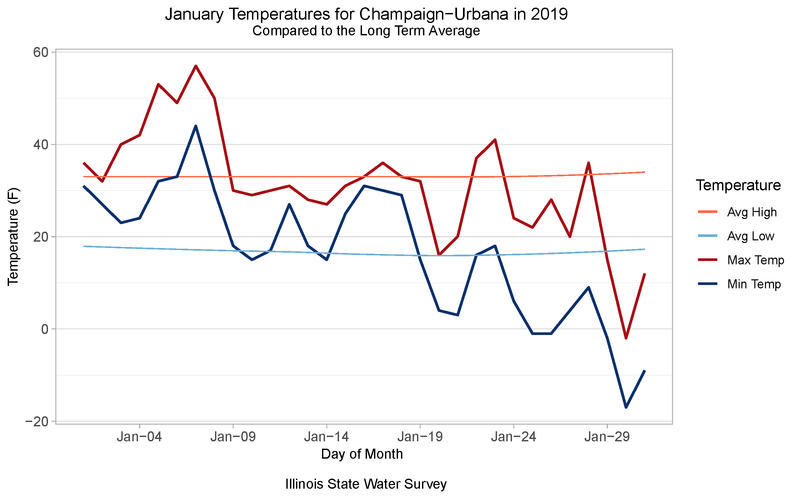 January temperatures were a roller coaster over the course of the month, as depicted in the plot below, showing high and low temperatures and averages for Champaign-Urbana throughout the month. 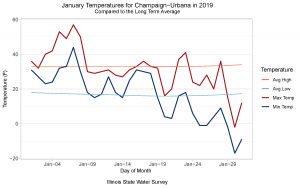 Champaign-Urbana was chosen since the State Climate Office is located here, but this trend can be representative of the state as a whole. Trends in temperatures across the entire state are depicted in the maps below.. The first 10 days of January saw statewide average temperature departures of around +9 to +14 degrees. 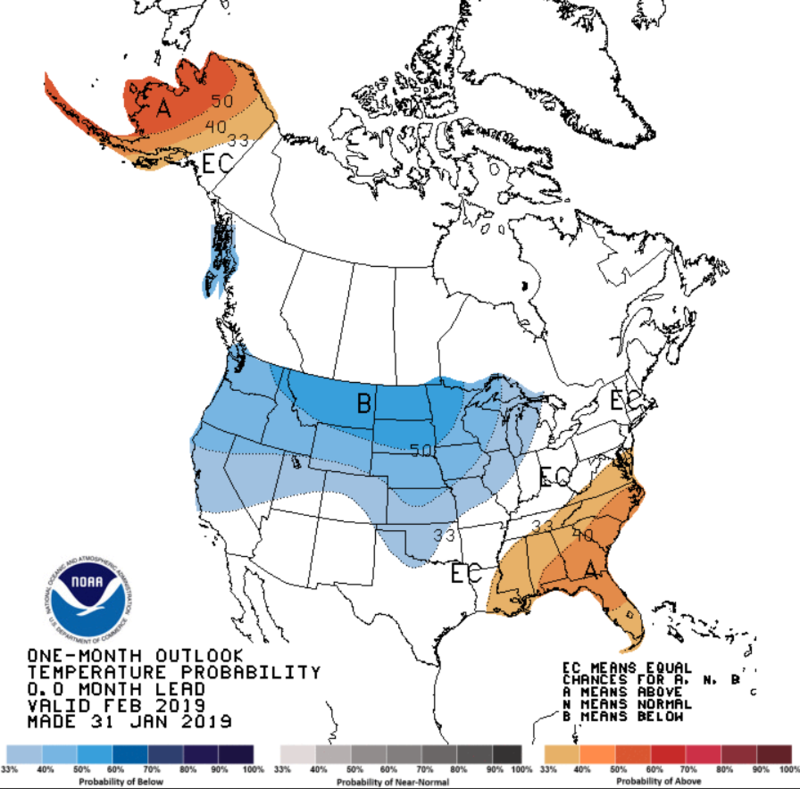 On the reverse end, looking at the last 10 days of the month, we experienced average temperature departures of around -5 to -21 degrees in a south to north pattern across the state. 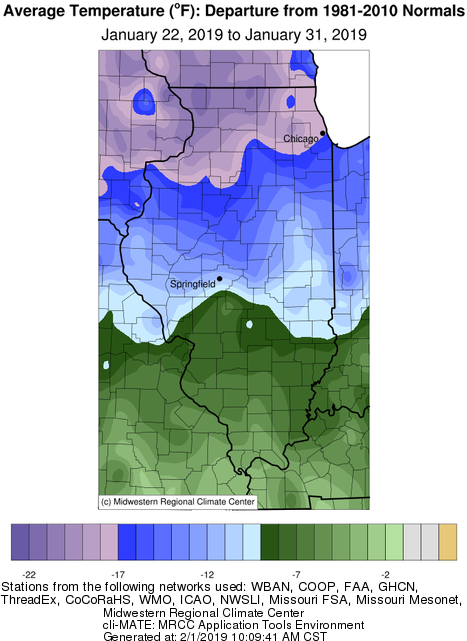 The most extreme departures were in Northwest Illinois. 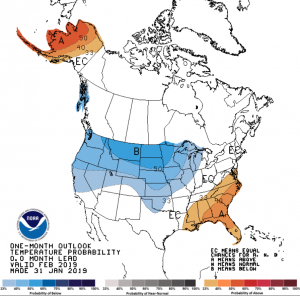 Temperatures for the month as a whole were closer to the long term average (see map below). 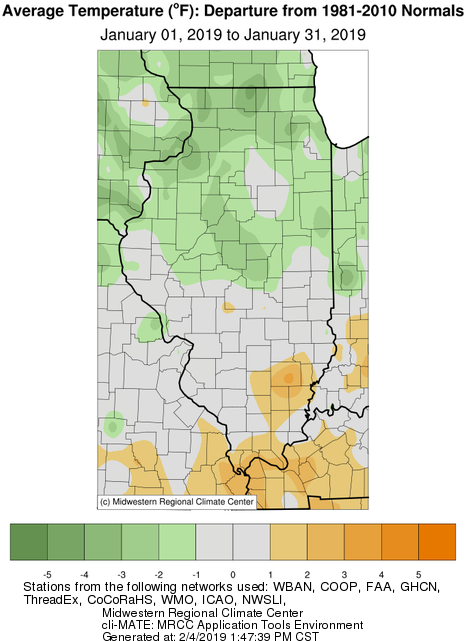 Regions near, and south of I-70 generally reported departures of one to three degrees above the long term average. However, many locations in Northern Illinois reported departures of one to three degrees below the long term average, while the central portion of the state was near to slightly below average. The highest temperature recorded for the month, was 66°F which occurred at two separate stations, Grand Chain Dam (Pulaski County) on January 2nd, 2019, and Jerseyville (Jersey County) on January 8th, 2019. The lowest temperature recorded for the month was -38°F* at Mount Carroll (Carroll County) on January 31st, 2019 – *this recording is currently under review by the State Extremes Committee. Preliminary statewide average precipitation for January was 3.51 inches, which is 1.44 inches above the long term average. An active weather pattern beginning in the middle of the month allowed several large weather systems, and numerous smaller clipper type systems to traverse the state. These storms were accompanied by heavy rains, accumulating snowfall, and sometimes icy precipitation. The heaviest precipitation fell in the south/southwestern portion of the state where 5 to 6+ inches were measured (see first map below). 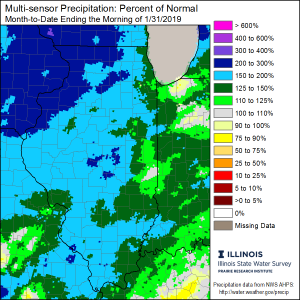 Many regions in Central and Northern Illinois received well over 100% of their average January precipitation, with Northwest Illinois receiving 200 to 300% (see second map below). 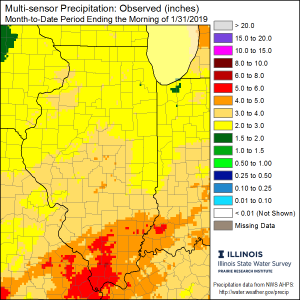 The highest monthly rainfall total of 6.50 inches occurred at a station near Cobden (Union County), 1.50 inches of which fell in a single day on January 5th, 2019. 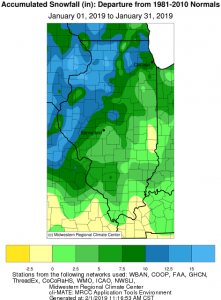 Snow was abundant across the state in January, with all of Illinois recording at least some accumulating snowfall. The highest snowfall totals of 15 to over 20+ inches were common in West-central and Northwest Illinois (see map below). These same regions generally recorded accumulations on the order of 10 to 15+ inches above the long term average. The highest monthly snowfall total was from Moline (Rock Island County) where 30.2 inches were reported, which is 20.8 inches above the long term average, ranking this as the snowiest January on record for the station. Rockford (Winnebago County) received 24.9 inches, which is 14.7 inches above the long term average for January. Chicago O’Hare reported a trace or more of snowfall for 15 consecutive days, from January 17th through January 31st. Ice cover on Lake Michigan increased to nearly 35% by the end of the month, according to data from the Great Lakes Environmental Research Laboratory (chart below). 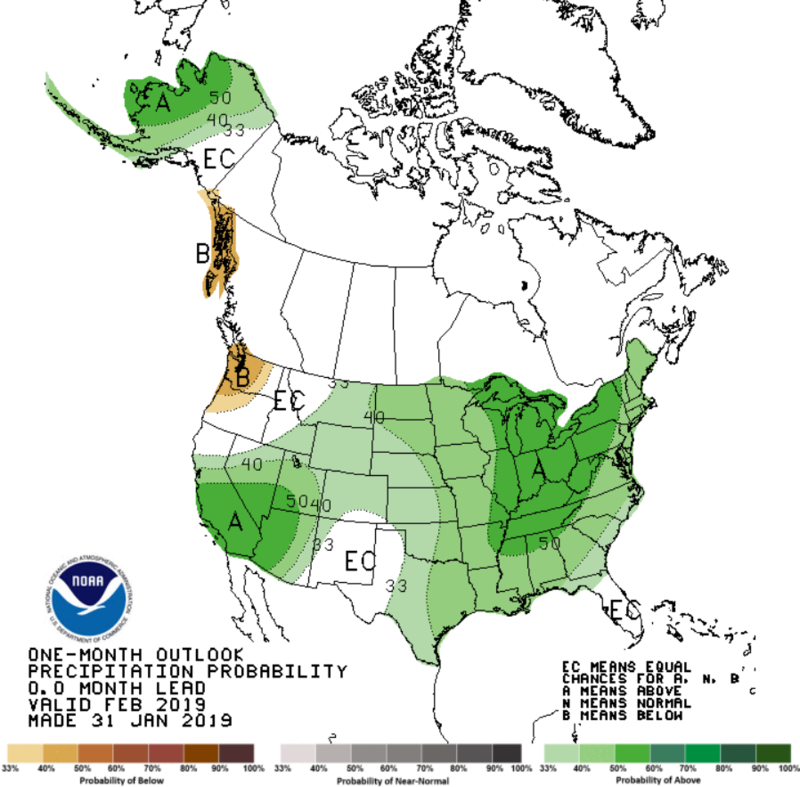 Looking ahead at the rest of February 2019, the Climate Prediction Center is forecasting an above normal chance for a wetter than average February statewide. The highest probabilities are located toward the eastern side of Illinois. 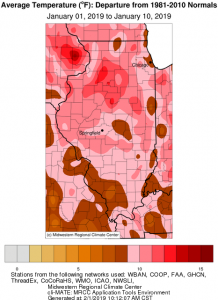 Below average temperatures are favored for much of Central and Northern Illinois, with no strong signal further south.